The latest Housatonic Recommended Mating is another that features a maiden mare heading to a proven stallion in an attempt to give her the best possible start to her breeding career — in this case, the big, beautiful, former $150,000 auction yearling Super Mama will visit Juddmonte Farm’s versatile stalwart, Mizzen Mast. Mizzen Mast was a Group 3-placed 2-year-old on turf in Europe, where as a sophomore he was a Group 3 winner and finished 2nd in the Grand Prix de Paris-G1. He shipped to the USA and Bobby Frankel’s barn midway through his 3-year-old season, and proceeded to score in in the Malibu-G1 going 7 furlongs on dirt. In his lone start at 4 he added a victory in the Strub-G2, also on dirt (and in which he set a new stakes record going 1-1/8 miles). Retired to stud at his owner/breeder’s Kentucky farm, Mizzen Mast has crafted a very respectable record at stud as the last remaining representative of Cozzene’s branch of the Caro sire-line. He reached 50 career stakes winners last year and his total is now at 51 (good for 5.2% of his foals of racing age). He had a huge year in 2017, with 24 stakes performers to his credit, which led to renewed interest in his services for 2018, when he covered a book of 72 mares. He also has 43 juveniles to represent him in 2019, including a colt out of Kentucky Oaks-G1 winner Flute (a full-brother to Grade 2 winner and Grade 1-placed Filimbi). One of Mizzen Mast’s other impressive claims to fame is that he has sired two Breeders’ Cup winners on the same card, when Mizdirection and Flotilla both triumphed in 2012. Mizzen Mast rates an “A” nick with Super Mama, due to his success when mated with mares from the Gone West sire-line — he has produced Hong Kong Group 1 winner Sea Defence, Grade 2 winner Jibboom, Grade 3 winners One Mean Man, Mizz Money and Seaspeak, plus three more stakes winners and at least five additional Graded performers from daughters of Gone West or that one’s sons (with daughters of Elusive Quality specifically, he’s sired the stakes winner Eden Prairie from just 12 foals of racing age). Mizzen Mast has also crossed well with Storm Cat-line mares (Super Mama’s own broodmare sire being Giant’s Causeway), with Grade 1 winner Sailor’s Valentine, Grade 2 winners Green Mask and Bailoutbobby, and Grade 3 winner Strike the Bell bred on that particular nick. Interestingly, the foal from this mating will be a complete outcross through 5 generations (as is Mizzen Mast himself), although going a bit further back we’ll find 3×6 crosses of both Caro and Graustark, and 6×6 to Somethingroyal via her sons Sir Gaylord and Secretariat. (Super Mama herself has Secretariat 4×5, and Northern Dancer 4x5x5.) Mares with Graustark, Northern Dancer and Mr. Prospector have long been recognized as being well-suited to Mizzen Mast. 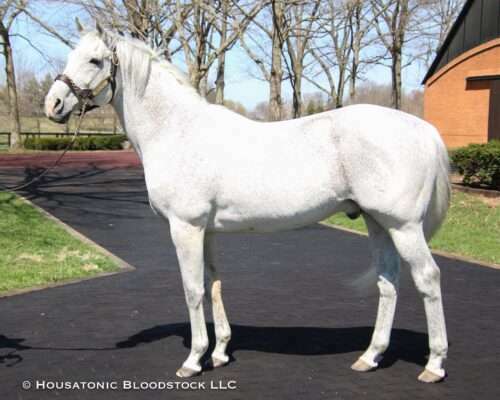 In addition to his own achievements at stud and the success of the specific crosses involved here, we like Mizzen Mast for Super Mama because her family has a deep, European and turf-slanted flavor to it, and although Mizzen Mast was versatile and can get dirt performers, he is predominantly a turf influence. We think that tapping into those grass roots will give Super Mama the best chance at a successful breeding career — not least because of all the races that her Maryland-bred foal will be eligible for on Laurel’s world class turf course.